2.25 Inch custom printed house shape acrylic keytags feature a split ring, an attached house shaped ornament in iconic houses shape. Your brand logo will be prominently displayed over this key tag. It makes a great promotional gift for conventions, tradeshows and businesses such as home insurance, real estate, construction, home improvement and home repair. Available at lowest price match, you can avail attractive discounts on bulk orders of these promotional key tags. 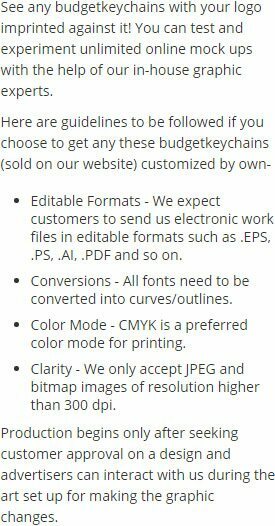 Our prices include artwork assistance and online design proof. 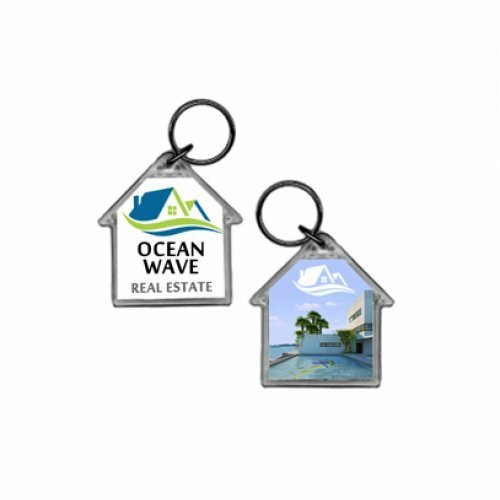 Request a quote to know what you may save on bulk orders of these 2.25 Inch personalized house shape acrylic keytags. Delivery time based on the mode of shipping chosen. Product & Design Quality -Customers love it! Probably going to order more when i run out! Customer Service & Shipping - It came fast but you need to ship to Guam! I had to ship to a friend and it was a bit of a hassle but it worked out! Product & Design Quality -They are really cute. Everyone loved them and the custom design was easy. I did ask them to change the first proof and the next one was perfect. Customer Service & Shipping - The designer was very nice and took all of my suggestions. It was fast too. think the very next day had my proof and I was in production. Product & Design Quality -Nice product at good price. Customer Service & Shipping - Excellent. Very impressed. Product & Design Quality -They turned out great! Customer Service & Shipping - Easy and on time! Product & Design Quality -They came out perfect! Customer Service & Shipping - Excellent and speedy!